Technically I am still on a blogging break...who am I kidding? My brain blogs constantly... blah, blah, blah,blah... The only difference today is that I am going to ignore hungry children and the mess that is my desk, so that I can transcribe the brain's "blah-blah-blah." I am having major brain strain and I need an outlet to relieve the pressure. 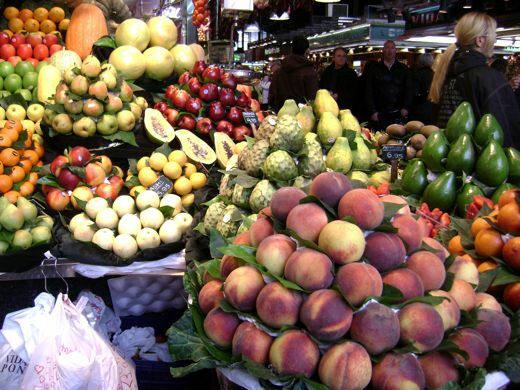 Mercat de la Boqueria... 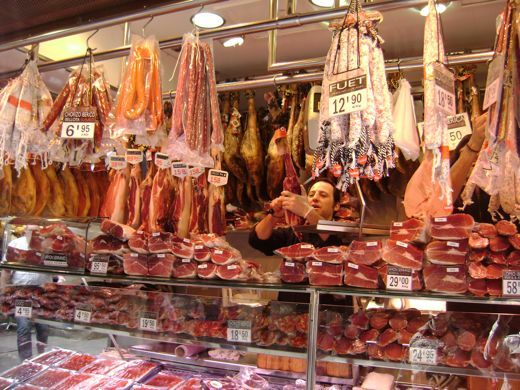 I do miss having a few slices of fuet with my breakfast. Operation Chicken Abroad was a huge success. Yes, there were false starts and some bumps, but even the challenges served to give me an appreciation and understanding for how to proceed with Part II of the experiment: Chickens Abroad! 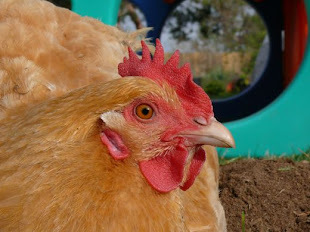 Speaking of chickens... which came first the chicken or the egg the lodging or the flights? My very helpful AAA travel agent took one look at our "plans" and suggested we... 1. Pare it down. A lot. 2. Find lodging first, because bed and breakfast for 6 is not an easy fit. We are looking for apartments, barns, small castles. 3. Buy our airline tickets. 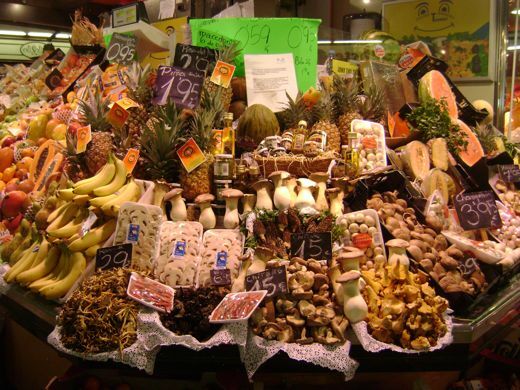 Las Ramblas may be "touristy," but I cannot wait to go back. 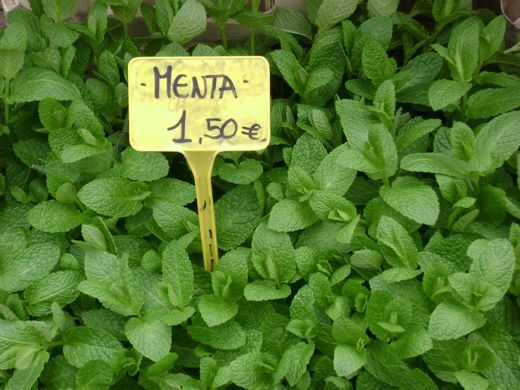 It is full of sights both entertaining and soothing, and any place that can offer mint this beautiful has to be good. So I went home and studied the maps and guide books and searched my feelings, hummed, pulled the ends of my hair and cracked my toes until I forgot what I was supposed to be doing. Then I bought our airline tickets! Oh dear. Was that the right order? Not. We have six reasonably priced roundtrip tickets to London. But, weren't you going to make use of your Chapter I Chicken Abroad in Barcelona experience, so that Chapter II would be easy and familiar? Hey. Hey! Don't mess with me! Those tickets were cheep cheap reasonable, and also, rumor has it they speak English in London. 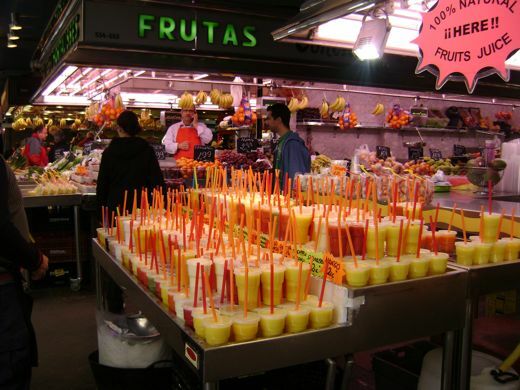 La Boqueria offers everything for the appetite, and like in the markets we know from Mexico, we found delicious fresh fruit juice. Alright, so nothing is going as planned, so far, but that doesn't mean we are on the wrong path. It's just a different path. And now my job is to figure out where to stay in Great Britain and to learn thousands of years of British history and how not to be rude in foreign countries, where to tip and when to say "England" instead of "GB" etc... Seriously, I have no idea where to go in London or how long we should stay there. I may have to figure out a way to explain to Geoff how we wound up spending a week in the Lake District and why it's delightful that we are walking the same country lanes that Beatrix Potter travelled. Sigh. Alex is pulling for the train ride to Edinburgh and castles, or "Go to a fancy well-to-do party and sip tea with the Queen." His accent is off, but hilarious nonetheless. Max would settle for a week at Legoland, Windsor. William, rational and reasonable as always, says he knows nothing about England and does not know what he wants to see. I will hand him the guide book asap. Geoff has museums and landmarks on his to-do list. Maria wants to live in a castle. And of course you don't have to have your fruit licuado. So, we have a lot to figure out. And we need help. Obviously. Then there is the rest of the trip, and this will include a week in Barcelona, time in Holland, which means time in Belgium, because you know geography. Geoff says he still wants to see something in France, and I say, Whoa! We are forgetting the "pare it down" directive! Okay. Barcelona and Holland are nonnegotiable. Can we do this? Yes, we can. I think so. Maybe. Did I mention we need help? 'shrooms! A mushroom walks in to a bar. The bartender points to the door and says, "We don't serve your kind here!" The poor little 'shroom replies, "Hey, I'm a fun-guy!" Look at those plump ones... don't they remind you of the Fantasia animated mushrooms? So cute. Hey. What's up with the rail passes? You pay for a rail pass, but then tickets or reservations are a separate fee? Is that right? Are there many six seater rental cars? Should we go to Hawaii, because I am really tempted at this point. Blah-blah-blah... Brain Strain! Englis is definatly a plus. I think you and your family will have fun no matter where you go. And London is a wonderful city. I have a friend who is a vet at the royal Vetrinary collage. So they love animals in London too :) Any kind of travel is hectic, and international travel is even more so. But you will be together and that seems to be when you all have the best times. Just don't let little miss princess stay toooo long in a castle you may never get her home again. Well you may, I bet they don't have wonderful moms and brothers like she has at home. Have fun planning it's part of the magic. Your English is great... I hear the enthusiasm loud and clear! Those photos are Gorgeous! Now I want to go to Barcelona, too. I have been to France, Italy, Greece and Ireland, but not to England or Spain. My dad always said that London was his favorite city in the world. He was a book lover so they must have had a lot of books... and he said he loved the British sense of humor. Wow... all of this traveling! You're amazing, woman! I wish I could travel, and bring my kids along for the experiences too! It sounds like you've got a lot to plan for - FUN! Crazy, crazy lady! How I look forward to your English adventures. Photos are marvellous - I've never seen so many mushies! Oooh, so many choices, no wonder your brain is exploding! I hear ya on the English language front. We went to the Lake district for 3 nights in 2007 see our travel blog for details www.donandlaura.spaces.live.com It should be under August 12-16th-ish, pics are under England or more England. GORGEOUS place. Divine! but seriously crowded at many times whcih definitely ruins some of the appeal. However the walking through Beatrix Potter part is lovely, as well as the back roads that take you throught Arethur Ransome 'Swallows and Amazons' territory. There is even a quaint little attraction for kids on BP in Windemere, as well as visits to her farm. Rent-a-car should be no problem. Legoland is expensive, but you probaby knew that. Drooling over mercat photos. Wow. Speechless. I have London maps if you want them, driving maps too, though we didn't drive. 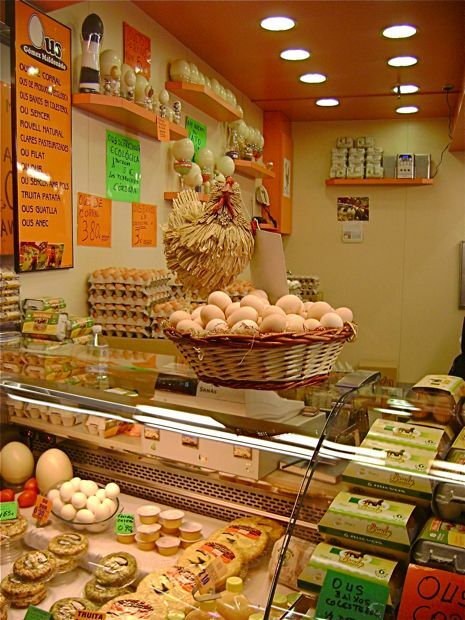 You must go to eggbeater's recommended bakeries! I am still picturing Maria living in a castle, wearing her beanerina outfit. She would fit right in! Sounds like all will have a great time! Yum! Your pics made me hungry. Wish we had a marke like that around our parts. trip planning...ugh! I have to say, not my favorite part. I'm sure you all will have the time of your life. The "bumps" in a trip usually turn out to be the best remembered and laughed about. Your photos have made me hungry! Your trip sounds great! My folks have been there so many times they are full of ideas. But you are full of ideas yourselves :) In London, the cabinet war rooms were especially interesting to me. As for visiting the Lake District and Edinburgh, those are both great picks I am sure. Can't wait to see your photos.